Editor’s Note: Andrew Carter is cofounder and CEO of Smallhold, a distributed farming pioneer, placing connected, autonomous mini-farms throughout the Northeast of the US–each capable of growing between 30 and 120 pounds of produce a week in a footprint the size of a refrigerator. They focus on organic mushroom production, growing hyperlocal food in grocery store produce aisles and restaurant dining rooms. We asked Carter to give us an in-depth look at why mushrooms are increasingly making their way onto consumers’ plates in 2019. One month into 2019, it’s clear that this year’s “it” produce is gourmet mushrooms. I’m admittedly biased, but the numbers speak for themselves: sales of specialty mushrooms have increased 240% over the last six years. Just take a look at your favorite top 10 list. What does this mean for grocery store shelves, and how did this come to be? The globalization of food has expanded the American palate, increasing demand for a broader range of cuisines, flavors and food experiences. These trends have introduced new words into the American lexicon and changed perceptions of old ones. “Ramen” was once a salty noodle block that only college students ate; now it’s a date spot. The word “umami” has found a place on menus from Brooklyn to Dallas. If there’s one produce category that embodies these trends, it’s exotic mushrooms. Mushrooms have been a staple food in international cuisines for thousands of years. Though most people are only familiar with a handful of varieties, there are at least 350 species of fungi collected and eaten around the world. These species represent only a fraction of what ultimately rolls up to be a whole kingdom (not phylum, class, order or family) of potential. It’s no secret that Americans are eating less meat. Conscious buyers drive trends, and report after report has been published on the environmental and health consequences of meat-centric diets. Instead, dollars typically spent on meat are going towards innovative substitutes and plant-based alternatives. 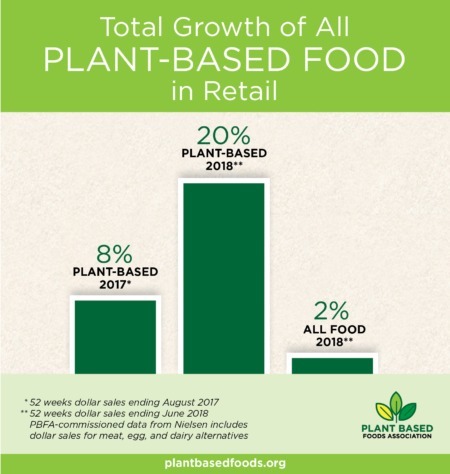 Last year, sales of plant-based foods increased by 20%, reaching a total of $3.3 billion, and overshadowing the 8% growth seen in 2017. But most meat replacements, while tasty and useful as transitional foods, have yet to be refined into healthy alternatives. Mushrooms, on the other hand, are a high-protein alternative to meat, holding their own on the center of the plate; think portabella steaks, or mushroom-based curries, tacos, soups and sautés. Mushrooms might even be more satiating than meat. In this era of food tribes and fad diets, mushrooms offer something for everyone. Whether you’re vegan, vegetarian, paleo, low-carb or kosher, mushrooms are on the menu. From Jean-Jorges’ mixed wild mushroom pizza to Shake Shack’s shroom burger, mushrooms are moving up on the menu. You can see evidence of this on Pinterest, where food is the top category among the platform’s 250 million global users. Last year, searches for mushroom recipes grew by 64%. Mushrooms are also a functional food, promising health benefits that supersede basic nutrition. In fact, fungi have been used in traditional medicinal practices for millennia. They contain over a dozen vitamins and minerals and an unusually high amount of antioxidants. Notably, they are the only source of vitamin D available in the produce aisle. The mainstream emergence of myco-supplement brands like Four Sigmatic, Om, and Mud/Wtr underscore a growing acceptance of mushrooms as medicine. The confluence of fresh mushroom supply and functional, healthy food demand is almost so perfectly timed it might seem suspicious. Large grow houses are gearing up to supply exotics, taking their lead from Asian counterparts for whom this sort of demand is normal. Watch for acquisitions over 2019 as the market begins to consolidate and grow, and for a heated turf battle as local growers compete more fiercely with imports. Twenty-five years ago, you’d find a limited selection of greens to choose from at the supermarket: iceberg lettuce, spinach, and possibly romaine. Fast-forward to 2019 and look at the shelves of your local Whole Foods. We’re now accustomed to a variety of greens, grown in a variety of ways, touting myriad benefits. Button mushrooms are to exotic mushrooms as iceberg lettuce is to kale, microgreens or Thai basil (to name a few). While they still dominate mushroom sales, exotic varieties are gaining ground. With increasing awareness, knowledge and appreciation of gourmet mushrooms, comes increasing sales. Consumers are exploring new taste profiles and seeking out the nutritional benefits of exotic varieties. The influence of restaurants and celebrity chefs is also playing a role in bringing exotics into the household. Shiitake, the number one seller in the exotic mushroom category, is highlighting this shift. Shiitake are widely recognized and, for many, serve as an introduction to the broad diversity of exotics. In its wake, varieties like oyster, royal trumpet and lion’s mane are popping up on grocery shelves. It’s no coincidence that button mushrooms are the most prevalent fungi on our supermarket shelves. Similar to produce like beefsteak tomatoes and red delicious apples, they are selected to endure 1,500-mile refrigerated highway trips and sustain for weeks in plastic packaging. In other words, there’s no issue with demand, and growers are actually able to meet it, for the most part. It’s just everything in between the farm and the grocery store shelf that’s getting in the way. Plenty of startups are emerging to serve our meatless, healthier consumer appetites. If you are one of the millions of meat-averse, pesticide-wary Whole Foods shoppers out there, you can now buy Impossible taco filling and non-dairy Chobani. Smallhold, in its own right, solved the issue of exotics distribution last year by putting the mushroom farm itself into the produce aisle. The Century of the Mushroom? Mushrooms are the representative produce of the modern grocery store shopper. Today’s consumer understands what they’re purchasing through a culturally informed lens and constantly evolving palate. Fungi transcend culinary trends, entering into a higher, longer-lasting category of potential productization and marketability. Mushrooms touch multiple important aspects of modern life, from health to beauty, breakfast to dinner, the forest to the temple. Exotic mushrooms have a rich history across cultures, and while the category has been experiencing healthy growth over the past two decades, we are on the edge of a produce shift that will skyrocket them to the top of the shopping list. In this context, it’s increasingly apparent that while 2019 is almost certainly the Year of the Mushroom for produce, it isn’t bound to be the Only Year of the Mushroom—and we’re looking forward to it.